The warmer weather has finally arrived, meaning blissful days spent on the sand and in the sun. Popular summer activities can wreak havoc on your locks; the harsh sun burning healthy hair dry and the salty sea turning vibrant smoothness to dull and discoloured frizz. This season, take control of your tresses with Wella's range of summer hair-care products; designed to improve and preserve your hair's condition to keep you sizzling all season! Everybody knows that UV protection is important for the skin but people often forget the importance of sun protection for their hair. 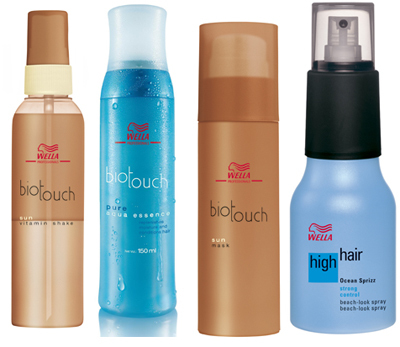 Wella's Biotouch Sun range shields hair against the negative influences of sun, sea and chlorinated water; resulting in luxurious locks full of shine, strength and energy. This innovative creation comprises of two stages: a milky phase containing double protection technology and a sun protection complex of nutrients and macadamia nut oil, which form a protective barrier against the sun. The second stage is the clear phase, which adds deep moisture to protect hair from drying out; keeping tresses tamed while the temperatures increases. This mild cleanser works perfectly on sun damaged hair by removing salt and chlorine residue which can strip the moisture from hair, while also protecting it against free radicals and harmful UV rays. The convenient two-in-one use of this shampoo makes it a perfect addition to your summer suitcase. This rich mask is a godsend for summer-stressed locks, providing intense care and moisture to prevent hair from drying out. The mask's strengthening formula works to protect cuticles from the damaging effects of the sun; ensuring moisture is locked in for healthy hair. Just as the body benefits from a detox program, it is also important to cleanse and revive hair, particularly in the hot summer months. Wella Biotouch has developed Pure, a two-step system comprising of a purifying shampoo and leave-in conditioner designed to detox your hair and keep it pure and full of life. Wella Biotouch's Purifying Shampoo contains a unique formula of soft micro beads that gently remove residual impurities, pollutants and product build up; leaving tresses cleansed and prepped for deep hydration. The added Panthenol binds the hydration into the hair and seals it to prevent moisture from escaping; ensuring locks remain healthy after long days in the sun. This leave-in treatment is the second stage of Wella Biotouch's Purifying process, which contains microencapsulated water droplets to amplify the hydrating effect, leaving hair feeling silky smooth and salonclean. Extensive styling can result in damaged and brittle hair, making it look dull and lacklustre, especially when combined with the effects of a summer lifestyle. The warmer weather consistently calls for sun kissed hair and tousled locks and Wella has created a range of styling products to help you take on summer with a splash. This formulation uses light colour protection milk to shield hair against the negative influences of sun, chlorinated water and styling. The end result is long lasting colour vibrancy and shine, combined with flexible movement and volume; an easy transformation from daytime beach babe to late-night party princess. A must-have for the party season, Ocean Sprizz helps to maximise that tousled look to keep you looking stunning all summer. The spray enables hair to be styled into strands and ropes, with strong control for a windswept beach look finish.